In today’s technological corporate world, almost all companies depend on the computer network for data storage, and an IT Auditor is hired to assess the organization’s programs and operations. 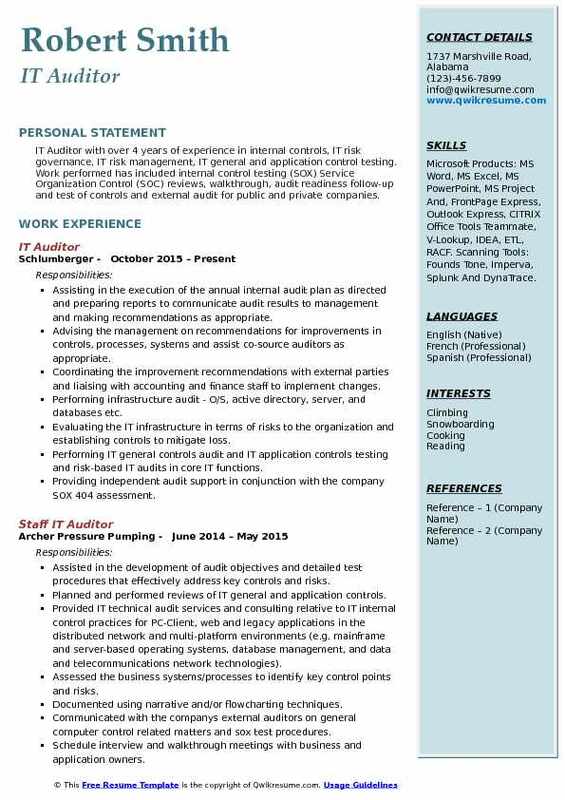 Typical duties listed on IT Auditor Resume include – maintaining regular operations, minimizing risks pertaining to IT and technology related products, analysing information security systems, programs and software; designing new systems, testing existing systems, maintaining optimal protection for file security, creating internal audit process, compiling associated audit reports and helping customers in their networking security concerns. The person in this profession should be technologically advanced, innovative, organized and detail-oriented; the other expected skills are – risk assessment abilities, internal audit experience, knowledge of IT security and infrastructure, the potential to work on various OS platform and familiarity with UNIX, Windows NT, MS Office, and SOX. The education requirement for this post includes a degree preferably in IT, Information systems, business administration or accounting. 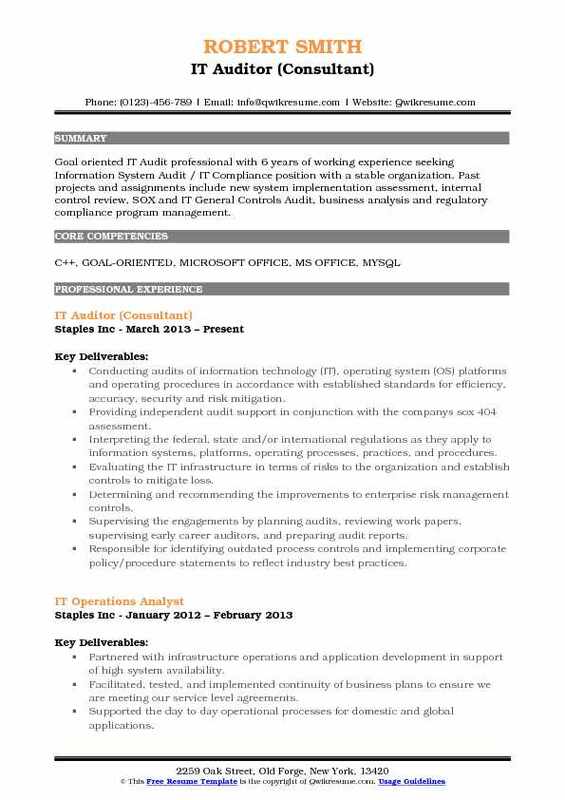 Summary : Analytical and experienced IT Auditor with 8 years of experience in the Technology domain acknowledged for sound decision-making abilities, business acuity, problem-solving, and project management skills. Strategic, methodical and reliable; enjoy the challenge of resolving long-term issues, and influencing revenue positive outcomes. Acute understanding of networking, hardware, software, and data centers, as well as emerging technologies, such as biometrics and mobile devices. Responsible for the management and delivery of IT and business process audits to ensure business risks were recognized and appropriately managed before the company was adversely affected. Performing data analysis and researching within the SAP systems and interpret data to strategically support business needs. Reassessing the controls and deficiencies and retesting all the identified key controls within SOX guidelines. Performing SAP audits and conducting pre and post SAP implementation reviews. Assessing IT control elements to mitigate IT risks regarding the confidentiality, integrity, and the availability of business information. Reviewing the systems for IT general controls, risk and compliance with policies and regulations. Engaging in ongoing communication with cross-functional partners to ensure companywide understanding of IT goals, soliciting feedback and fostering cooperation. Identifying and evaluating the risks during review and analysis of system development life cycle (SDLC), including Design, Testing/QA, and Implementation of systems and upgrades. Performing general computer controls review to verify compliance with SOX section 404. Skills : Microsoft Excel, Word, PowerPoint, JMP Statistical Software, Microsoft Project, Share Point And Archer, ACL, And IDEA. Planned and managed the ITGC audit functions using best practice audit guidelines in compliance with COSO and COBIT standards. Knowledge of vulnerability assessment of operating systems (Unix/Linux, Windows). Conducted walkthrough, formulated test plans, documented gaps, tested the results and exceptions. Performed assessment of IT internal controls as part of the compliance and operational audits. Identified and communicated audit findings to senior management and client. Implemented process improvements to SOX testing, resulting in efficiency in review time and desirable financial reporting. Knowledgeable in ERP (SAP) business processes and testing of relevant controls. Performed all stages of the audit including, planning preparing the audit program, fieldwork executing, reporting and follow up. Reviewed SDLC, designed, and implementation of process and automated controls, data created final audit reports and oversaw the implementation of creative action plans while maintaining communication with all levels of management. Met with plan owners and company client to remediate audit findings/exceptions and as follow up to ensure system security. Performed assessments of application controls and IT general controls such as access control, change management, operations, disaster recovery and job scheduling. Supported the development, implementation, and monitoring of data confidentiality, system integrity, system reliability, recovery methods and procedures. 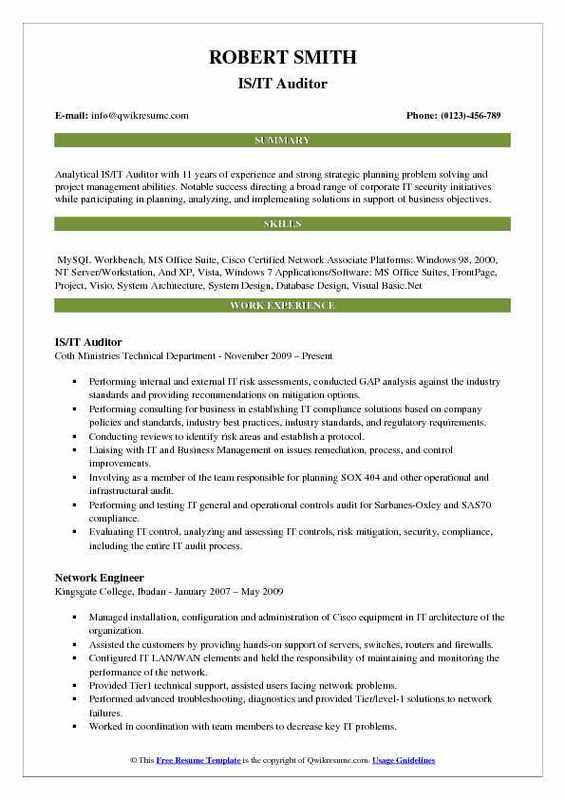 Summary : Analytical IS/IT Auditor with 11 years of experience and strong strategic planning problem solving and project management abilities. Notable success directing a broad range of corporate IT security initiatives while participating in planning, analyzing, and implementing solutions in support of business objectives. Performing internal and external IT risk assessments, conducted GAP analysis against the industry standards and providing recommendations on mitigation options. Performing consulting for business in establishing IT compliance solutions based on company policies and standards, industry best practices, industry standards, and regulatory requirements. Conducting reviews to identify risk areas and establish a protocol. Liaising with IT and Business Management on issues remediation, process, and control improvements. Involving as a member of the team responsible for planning SOX 404 and other operational and infrastructural audit. Performing and testing IT general and operational controls audit for Sarbanes-Oxley and SAS70 compliance. Evaluating IT control, analyzing and assessing IT controls, risk mitigation, security, compliance, including the entire IT audit process. Working with the audit project team to achieve departmental goals and to ensure awareness of changes in business activities and objectives. Performing audit follow-up activities to test the implementation of managements responses to audit findings. 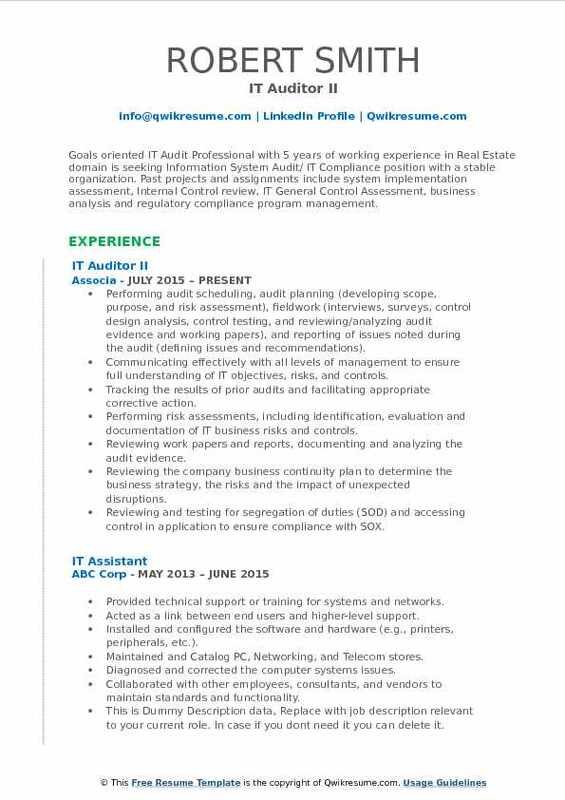 Headline : Goals oriented IT Audit Professional with 5 years of working experience in Real Estate domain is seeking Information System Audit/ IT Compliance position with a stable organization. Past projects and assignments include system implementation assessment, Internal Control review, IT General Control Assessment, business analysis and regulatory compliance program management. Performing audit scheduling, audit planning (developing scope, purpose, and risk assessment), fieldwork (interviews, surveys, control design analysis, control testing, and reviewing/analyzing audit evidence and working papers), and reporting of issues noted during the audit (defining issues and recommendations). Communicating effectively with all levels of management to ensure full understanding of IT objectives, risks, and controls. Tracking the results of prior audits and facilitating appropriate corrective action. Performing risk assessments, including identification, evaluation and documentation of IT business risks and controls. Reviewing work papers and reports, documenting and analyzing the audit evidence. Reviewing the company business continuity plan to determine the business strategy, the risks and the impact of unexpected disruptions. Reviewing and testing for segregation of duties (SOD) and accessing control in application to ensure compliance with SOX. Implementation and assessment of security and business process control in the application including segregation of duties, structural authorizations, access restrictions, role and profile assignments. Testing application controls, including both logical and physical access, controls to ensure the effectiveness of functionality, good reporting, and interfaces. 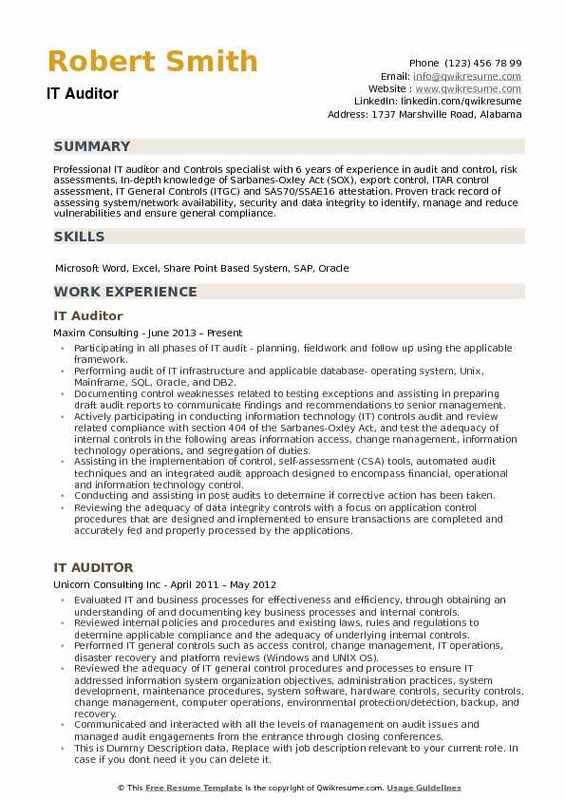 Objective : IT Auditor with over 4 years of experience in internal controls, IT risk governance, IT risk management, IT general and application control testing. Work performed has included internal control testing (SOX) Service Organization Control (SOC) reviews, walkthrough, audit readiness follow-up and test of controls and external audit for public and private companies. Skills : Microsoft Products: MS Word, MS Excel, MS PowerPoint, MS Project And, FrontPage Express, Outlook Express, CITRIX Office Tools Teammate, V-Lookup, IDEA, ETL, RACF. Scanning Tools: Founds Tone, Imperva, Splunk And DynaTrace. Assisting in the execution of the annual internal audit plan as directed and preparing reports to communicate audit results to management and making recommendations as appropriate. Advising the management on recommendations for improvements in controls, processes, systems and assist co-source auditors as appropriate. Coordinating the improvement recommendations with external parties and liaising with accounting and finance staff to implement changes. Performing infrastructure audit - O/S, active directory, server, and databases etc. Evaluating the IT infrastructure in terms of risks to the organization and establishing controls to mitigate loss. Performing IT general controls audit and IT application controls testing and risk-based IT audits in core IT functions. Providing independent audit support in conjunction with the company SOX 404 assessment. Testing and documenting the financial and information systems for data integrity and quality. Assisting in the preparation and periodic review of a comprehensive company risk assessment. Summary : IT Auditor with 7 years of experience in the Finance domain is seeking a position as an IT Auditor in a firm where I can utilize my experience to deliver on business compliance, reporting related organizational objectives. Well versed in enterprise and IT risks, multi-platform and business process controls and the SOX 404 auditing and financial reporting objectives and standard. Met the business process and controls owners to document the respective IT and business processes to understand and document the process for SOX 404 compliance. Obtained and reviewed the documentation around purchasing, inventory, sales, and finance to the understand the risk point within the process. Evaluated control design effectiveness via walkthroughs from end to end to determine the design effectiveness of the controls. Reviewed and updated IT process documentation to evaluate currency and pertinence and also gain sufficient understanding of the risks. Reviewed internal policies, procedures, and standards to validate that managements directives have been appropriately captured and formalized to mitigate risks and achieve compliance and reporting objectives. Performed business process testing of controls around access provisioning and user security, system configuration management, program change management, business continuity, and segregation of duties in the SAP and CMS systems. Performed ITGC control testing within the access provisioning, program change management, program development and computer operations domains. Performed testing of technical control on the AS400, DB2, and Windows platform to verify appropriate security have been configured and is operating effectively to safeguard it data and systems. 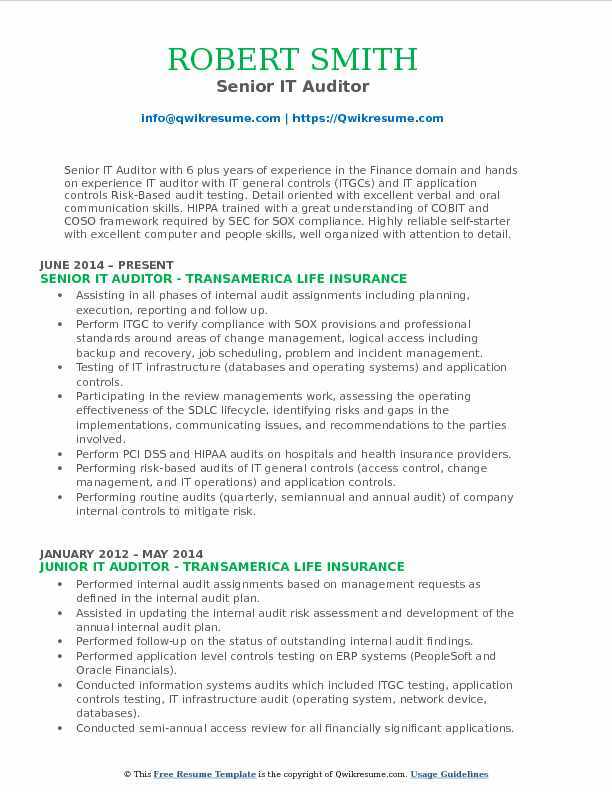 Headline : Senior IT Auditor with 6 plus years of experience in the Finance domain and hands on experience IT auditor with IT general controls (ITGCs) and IT application controls Risk-Based audit testing. Detail oriented with excellent verbal and oral communication skills. HIPPA trained with a great understanding of COBIT and COSO framework required by SEC for SOX compliance. Highly reliable self-starter with excellent computer and people skills, well organized with attention to detail. Assisting in all phases of internal audit assignments including planning, execution, reporting and follow up. Perform ITGC to verify compliance with SOX provisions and professional standards around areas of change management, logical access including backup and recovery, job scheduling, problem and incident management. Testing of IT infrastructure (databases and operating systems) and application controls. Participating in the review management's work, assessing the operating effectiveness of the SDLC lifecycle, identifying risks and gaps in the implementations, communicating issues, and recommendations to the parties involved. Perform PCI DSS and HIPAA audits on hospitals and health insurance providers. Performing risk-based audits of IT general controls (access control, change management, and IT operations) and application controls. Performing routine audits (quarterly, semiannual and annual audit) of company internal controls to mitigate risk. Performing IT infrastructure audit of databases, servers, networks etc. Conducting audits of operating system (OS) platforms, information technology, and operating procedures in accordance with established standards for efficiency, accuracy, security and risk mitigation. 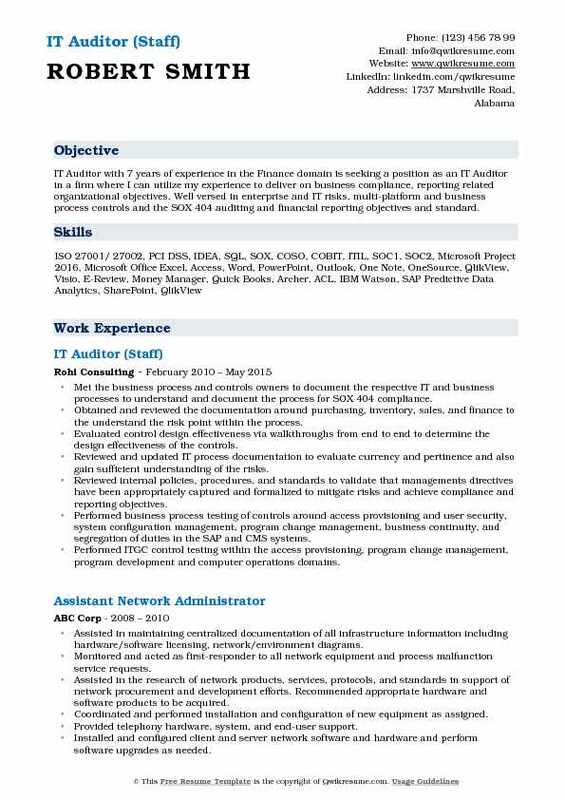 Headline : Goal oriented IT Audit professional with 6 years of working experience seeking Information System Audit / IT Compliance position with a stable organization. Past projects and assignments include new system implementation assessment, internal control review, SOX and IT General Controls Audit, business analysis and regulatory compliance program management. Conducting audits of information technology (IT), operating system (OS) platforms and operating procedures in accordance with established standards for efficiency, accuracy, security and risk mitigation. Providing independent audit support in conjunction with the company's sox 404 assessment. Interpreting the federal, state and/or international regulations as they apply to information systems, platforms, operating processes, practices, and procedures. Evaluating the IT infrastructure in terms of risks to the organization and establish controls to mitigate loss. Determining and recommending the improvements to enterprise risk management controls. Supervising the engagements by planning audits, reviewing work papers, supervising early career auditors, and preparing audit reports. Responsible for identifying outdated process controls and implementing corporate policy/procedure statements to reflect industry best practices. Managing the project status, facilitating audit status meetings to communicate findings, issues, and areas for improvement to client management, executive leadership, and corporate internal audit leadership. 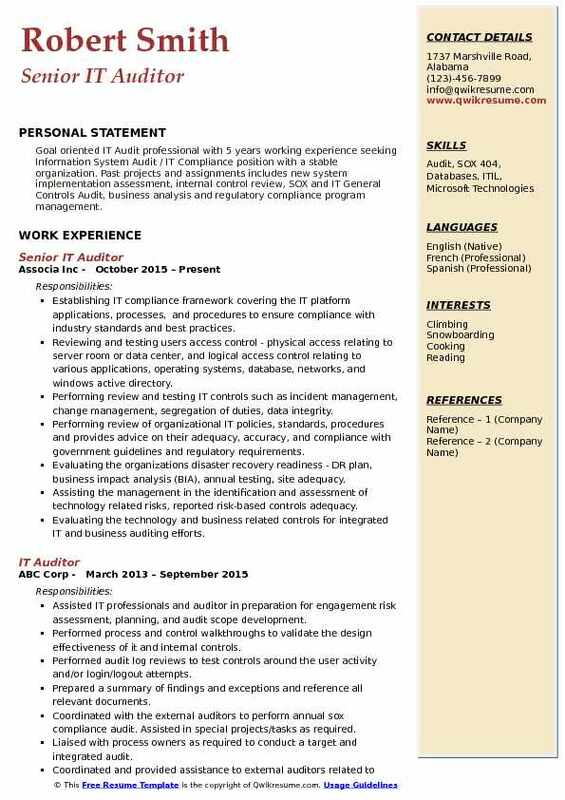 Headline : Goal oriented IT Audit professional with 5 years working experience seeking Information System Audit / IT Compliance position with a stable organization. Past projects and assignments includes new system implementation assessment, internal control review, SOX and IT General Controls Audit, business analysis and regulatory compliance program management. Establishing IT compliance framework covering the IT platform applications, processes, and procedures to ensure compliance with industry standards and best practices. Reviewing and testing users access control - physical access relating to server room or data center, and logical access control relating to various applications, operating systems, database, networks, and windows active directory. Performing review and testing IT controls such as incident management, change management, segregation of duties, data integrity. Performing review of organizational IT policies, standards, procedures and provides advice on their adequacy, accuracy, and compliance with government guidelines and regulatory requirements. Evaluating the organization's disaster recovery readiness - DR plan, business impact analysis (BIA), annual testing, site adequacy. Assisting the management in the identification and assessment of technology related risks, reported risk-based controls adequacy. Evaluating the technology and business related controls for integrated IT and business auditing efforts. Coordinating and executing the projects and ensuring security risks/vulnerabilities are identified, communicated and remediated. Measuring the adequacy of the quality of IT service delivery, through the review of key controls in incident management (help desk), problem, and release and change management. 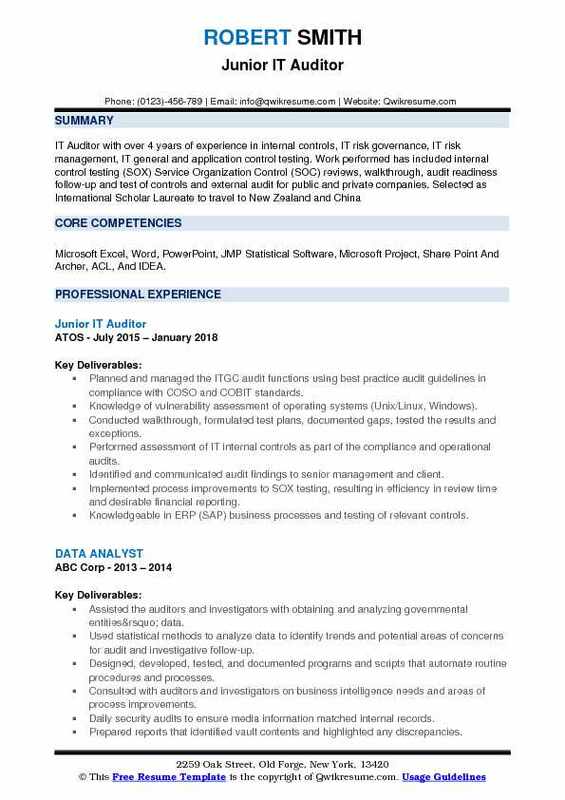 Headline : Professional IT auditor and Controls specialist with 6 years of experience in audit and control, risk assessments, In-depth knowledge of Sarbanes-Oxley Act (SOX), export control, ITAR control assessment, IT General Controls (ITGC) and SAS70/SSAE16 attestation. Proven track record of assessing system/network availability, security and data integrity to identify, manage and reduce vulnerabilities and ensure general compliance. Participating in all phases of IT audit - planning, fieldwork and follow up using the applicable framework. Performing audit of IT infrastructure and applicable database- operating system, Unix, Mainframe, SQL, Oracle, and DB2. Documenting control weaknesses related to testing exceptions and assisting in preparing draft audit reports to communicate findings and recommendations to senior management. 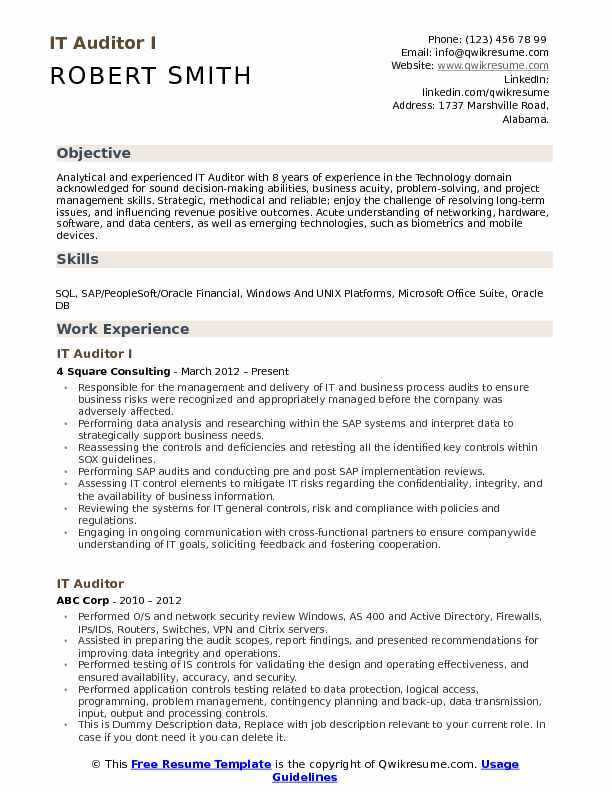 Actively participating in conducting information technology (IT) controls audit and review related compliance with section 404 of the Sarbanes-Oxley Act, and test the adequacy of internal controls in the following areas: information access, change management, information technology operations, and segregation of duties. Assisting in the implementation of control, self-assessment (CSA) tools, automated audit techniques and an integrated audit approach designed to encompass financial, operational and information technology control. Conducting and assisting in post audits to determine if corrective action has been taken. Reviewing the adequacy of data integrity controls with a focus on application control procedures that are designed and implemented to ensure transactions are completed and accurately fed and properly processed by the applications. Ensuring that industry standards "strong password algorithm" is being deployed on network and business application. Ensuring access privileges and permission are on a need-to-know basis.